Our product range includes a wide range of slip sheet. The slip sheet is used as a pallet support device in vehicle delivery and transportation of products. When slip sheets are supported by a pallet board, flat load carrying surface, or a cart or fork lift truck, the structural strength of the slip sheet supports the product load's weight. With the slip sheet supported by one of these transportation devices the unit load can easily be transported both internally within a facility and externally between two facility locations. The first type of slip sheet is the single lip (tab) slip sheet. With a single lip, the lip faces the narrow part of the rectangular shaped unit load and the delivery truck door. This slip sheet variation maximizes the delivery truck's space utilization and loading and unloading process productivity. Also, with a single lip, the travel path clearance is minimized as the lip faces the unit load carrier. The second type of slip sheet is the multi-lip slip sheet. This type of slip sheet is generally used on a container placed onto arailroad car or an ocean delivery vehicle due to the necessary loading/unloading patterns. This allows a loading device to load the slip sheet unit load from one side and an unloading device to unload the load from another side depending on the number and pattern of the remaining lips. 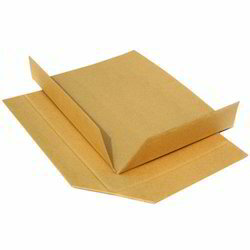 The corrugated fiberboard consists of two Kraft liner board outer surfaces with a corrugated interior that is bonded together with adhesive or glue. This bonded material provides the necessary strength for the push-pull device to clamp the slip sheet once or twice. There are several disadvantages associated with this type of slip sheet material including that it is not very durable, moisture resistant, resistant to high humidity or usable in cold storage areas. The advantages associated with this material are low cost, one-way use, and its ability to be moved by a conveyor or lift truck with a slip sheet device. With a single lip, the lip faces the narrow part of the rectangular shaped unit load and the delivery truck door . This slip sheet variation maximizes the delivery truck's space utilization and loading and unloading process productivity . Also, with a single lip, the travel path clearance is minimized as the lip facing the unit load carrier. The second type of slip sheet is the multi-lip slip sheet (Fig. 2). This type of slip sheet is generally used on a container placed onto a rail car or an ocean delivery vehicle due to the necessary loading/unloading patterns . This allows a loading device to load the slip sheet unit load from one side and an unloading device to unload the load from another side depending on the number and pattern of the remaining lips. It is just like a paper so can save more space of the containers and the transportation vehicles. Save the transportation fee because of its portability and small bulk. Need small store space, 1000PCS=1CBM. Looking for Slip Sheet ?